On the first day of this year’s Leadership Training Summit, we had the great pleasure of listening to two dynamic and culture-blending musicians, Abigail Washburn and Wu Fei. 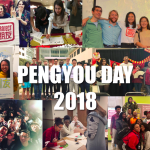 On the first day of this year’s Project Pengyou Leadership Training Summit, we had the great pleasure of listening to two dynamic and culture-blending musicians, Abigail Washburn, an American folk musician and banjo player and Wu Fei, guzheng virtuoso. The performance was the perfect ending to full day of examining the present implications of US-China history, hearing moving emotional stories of the training participant’s motivations to become US-China bridge-builders, and introducing concepts of nonviolent communication theory. As we sat down and the first few chords were struck, there was an emotional resonance in the room. The music they shared with us was a mesmerizing blend of two traditions and a beautiful representation of years of a friendship that defies would-be barriers of nationality, language, and geography. We especially enjoyed the harmony with which they wove together two melodies from Chinese and American folk music tradition. It was magical hearing the complementary tunes in Chinese and English that even had the same theme (they both pay tribute to a life on the water, watch the video here). Interspersed with the songs was the story of this friendship and how each woman came to know about the US, China and herself. Abigail told us the story of how she ventured to China with hopes to work there as a lawyer, but instead found herself playing the banjo and singing folk music all across the country. Through her travels, she not only came to understand China but also how powerful music can be as a method of connecting hearts. Wu Fei explained how growing up as a guzheng virtuoso she lost herself in the tradition until an American professor commented on her skills: “That was technically brilliant, but I didn’t hear Fei in there at all.” This sparked in her a desire to find her own style, which led to her love of “playing around” that has molded her unique improvisation skills. As for how the two found each other, it was through a mutual friend. We want to express our heartfelt thanks to both Abigail and Wu Fei, who flew into Boston specifically for this performance and even attended part of the training on the second day. 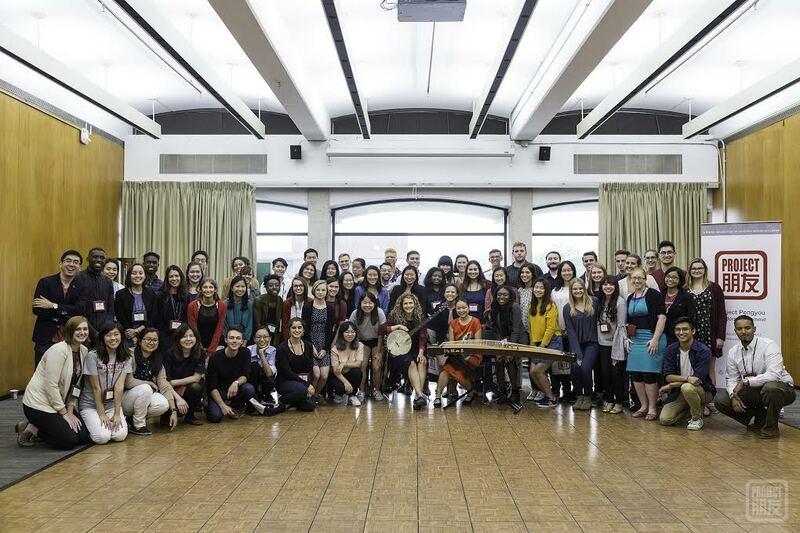 Their passion for cultural exchange sets a wonderful example of what US-China friendship really looks like. It reminded us not only that deep and true friendships across cultures are not only rewarding for ourselves, but for the world as well. We look forward to their future collaboration album which they mentioned would be out in 2018! Abigail Washburn is a Grammy award-winning vocalist, songwriter and clawhammer banjo player based in Nashville, TN. A Mandarin Chinese speaker, Abigail regularly toured China for 20 years, including a month-long tour of China’s Silk Road supported by grants from the US Embassy, Beijing. Abigail’s musical projects range from her string band, Uncle Earl, to her bilingual releases Song of the Traveling Daughter (2005) & City of Refuge (2011), to the mind-bending “chamber roots” sound of the Sparrow Quartet (featuring Bela Fleck, Casey Driessen and Ben Sollee), to Afterquake, her fundraiser CD for Sichuan earthquake victims. Her most recent record with her husband, Bela Fleck, won a 2016 Grammy for Best Folk Album. 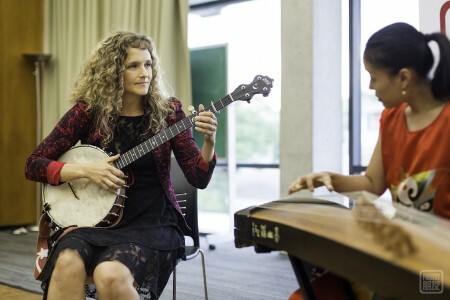 Abigail is a TED Fellow and gave a talk at the 2012 TED Convention in Long Beach titled “Building US-China Relations…by Banjo” where she spoke about her true story of shifting from a future in law to a pursuit of musical bridging. NPR voted Abigail’s 2012 commencement speech at her alma mater, Colorado College, as one of the best 300 in US history. In March of 2013, she was commissioned by New York Voices and the NY Public Theater to write and debut a theatrical work, Post-American Girl, which drew from her 17-year relationship with China and addressed themes of expanding identity, cultural relativism, pilgrimage and the universal appeal of music. 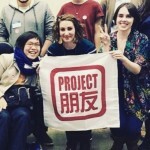 Abigail is also the first US-China Fellow at Vanderbilt University. Wu Fei is a native of Beijing and a current Nashville resident, is a master of the guzheng, the ancient 21-string Chinese zither. She was trained as a Western classical composer, a vocalist, and plays beautifully in the guzheng’s vernacular – a musical language which is at least 2,000 years old. She mixes her Western and Chinese traditional sensibilities with a contemporary idiosyncratic, experimental dialect nurtured by years spent at Mills College and immersed in the New York downtown improvisation scene which revolved around venues like The Stone, where Fei has frequently performed and curated. Fei composes for choir, string quartet, chamber ensemble, Balinese gamelan, and orchestra; her commissions range from a composition for Percussions Claviers de Lyon that premiered in the Forbidden City Concert Hall in Beijing to live performances in Paris and Tokyo for luxury brand Hermes. In addition to her own original compositions, Fei has collaborated with many artists of different disciplines and genres ranging from Bela Fleck to avant-garde composer John Zorn. She has taken her guzheng and her music around the world and touring highlights include composition premiere at the Forbidden City Concert Hall in Beijing, the MoMA in New York City, North Sea Jazz Festival in the Netherlands, Vossa Jazz Festival in Norway, Europalia in Belgium, and the Big Ears Festival in Knoxville, TN. Wu Fei was recently commissioned by Intersection Ensemble in Nashville, TN to create new classical work for guzheng, voice and western chamber ensemble which she titled If I Was A Batman Queen. For more photos highlights, see our photo album from the 2017 Leadership Training Summit!